“I can say yes. 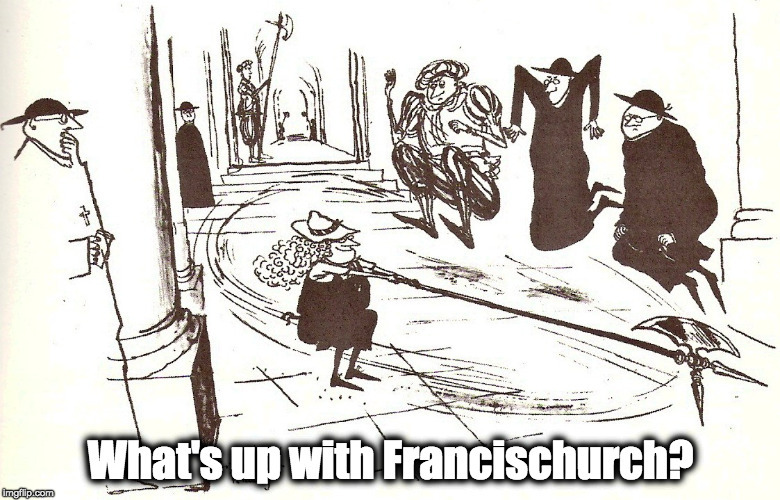 Period.” – well, that’s that, then… – What's Up With Francis-Church? I just got off the phone with a friend in the City, and we were trying to think of something to do, anything that might be useful to even say, at this incredible situation. The other day I was having a nap, and I had a kind of half-waking dream that I was in Casa Santa Martha in the cafeteria that he affects to use, and he was having one of his patented hissyfits over some one opposing him, as you do, and I got up onto a table and just started shouting at him. I have a kind of fantasy that stems from my frustration, that is growing minute-by-minute, with the people who are still saying ‘nothing to see here.’ I can think of little to say to them. What can you say to someone who refuses to acknowledge that gravity makes things fall down. I have to write something about this for the Remnant which is what I’m going to be doing for the rest of the weekend (so, sorry, but this will be it until at least Monday). But it seems a bit redundant to me now. If this isn’t enough for the people we are trying to warn, I can’t imagine what would be. Maybe in five or six languages. Every day. Until he repents. Pope Francis: repent your blasphemy! Please don’t for a second imagine I intended a criticism of you or any in the ‘entire rogues gallery’, you’re all my heroes! I’m grateful for all the work you do and know that it is important the way you highlight and bring to attention so much of the dreadful reality of what is going on. Just letting you know how I relate to the same kind of fantasy that stems from the frustration I share when it seems that nothing this pope can say or do will wake some people up to the fact he is a full fledged enemy of the Faith. A English translation of the direct, unambiguous and unpopular words that were spoken by our Lord, Himself: “But I say to you, That whoever shall put away his wife, saving for the cause of fornication, causes her to commit adultery: and whoever shall marry her that is divorced commits adultery.” (Matt. 5:32) Jesus did not give us false mercy! This is REAL mercy, albeit hard to live, at times. Francis the First CANNOT CHANGE Jesus’ own words which cannot be misinterpreted, except on purpose. If misinterpreted on purpose, the person doing so has intentions that are from the Evil One, Satan, and designed to deceive. They have NO PART in His Church’s teaching. It would deny the first spouse of any legitimate outlet for his or her innate desires to consumate the physical part of the “joy of love” in marriage, i.e. sexual relations between a man a wife. The abandoned, humiliated and forgotten party (spouse and, likely, children) are shown NO MERCY for keeping to the vows Jesus Christ commanded they keep. One question? If even the milquetoast EWTN can muster up the courage to question this HERETIC, where are the Cardinals, particularly Burke, fighting the good and noble fight for Jesus our King?! Pretty soon, boys, there won’t be much of a Church left to fight for. Yes, this is apostolic work even if the beneficiaries are only ourselves. I maintain that writing about it in public forums, with our real names attached, is doing something. I have received countless messages from people who read me and Ann and Steve and Chris and Mike and John and the entire rogues gallery, that they would not be sustaining their faith without it. We even receive notes from people who say that her clear denunciation has led them to examine their own defects in faith and convert more closely to Christ. That seems like doing something to me. The debating part, I agree, seems more like running around in circles, but even that is a means to the end of creating more clarity, or at least, it can be. It isn’t doing everything that can be done, but it does count as a thing. I think it isn’t the last thing, but actually more like the first thing that we will be doing. But it is a Thing. Um. Get your capslock fixed before you comment again. We don’t do screamers. I just had a vision of signs that say this posted anonymously all over our villages, towns, cities. Of course the prayers will still be needed. But just imagine if these signs kept popping up, and no one knew who was posting them. They can’t shoot the messenger if they don’t know who it is, and the message is too shocking to ignore. THE POPE CITED CARDINAL SCHONBORN’S INTERPRETATION AS WHAT THE POPE INTENDED WITH HIS DOCUMENT, AND THAT CARDINAL PRAISED THE POPE’S CHANGE IN THE CHURCH’S LANGUAGE. FURTHERMORE, SCHONBORN PRAISED IT AS A GREAT, GREAT CATECHESIS ON FAMILY ISSUES. IN OTHER WORDS, POPE FRANCIS IS CLEARLY COLLABORATING WITH A BUNCH OF LIBERALS TO CHANGE THE CATECHISM, ONE DOCUMENT AT A TIME. OK Lionel, that’s the end of the conversation. O.K we understand this here and there could soon be clarification from the Press Office. He is saying that doctrine has changed based on the new moral and salvation theology approved by Pope Benedict and which is being taught in the pontifical universities and seminaries for a long time. So Cardinal Burke and Fr.Zuhlsdorf could probably also say that there is no change in doctrine. Pope Francis could mean that there are known exceptions to the traditional teaching on mortal sin.Last month Pope Benedict announced via Avvenire that there are known exceptions in Vatican Council II to the 16th century interpretation of the dogma extra ecclesiam nulla salus. So the new moral theology is that the conditions for mortal sin mentioned in the Catechism edited by Cardinal Ratzinger and Schonborn, refer not to hypothetical cases, known only to God ,but to defacto, objectively known cases which can be identified by us humans. So even if someone is in objective mortal sin,we cannot say so, since there could be ‘known factors’ which make the case an exception. So the two popes like Cardinal Burke and Fr.Z and the numerous religious who have had their formation at the Angelicum , Anthonianum etc in Rome will say that there is no change in doctrine. Cardinal Kasper has already given an interview to the Tablet saying that everything has changed but there is no change in doctrine. That is a very sensible idea. I hope people start doing that. During the in-flight interview, Bergoglio also touched on his meeting with Bernie Sanders. “It was a simple greeting, nothing more. That’s called manners, not meddling in politics. If someone thinks that a welcome is the same as mixing in politics, I recommend him a psychiatrist”. I’m inclined to call him a dishonest something or other. But instead I’ll just contemplate delicate fatherly charity manifest in his comments. Everyone is focusing on the text and footnotes concerning…ahem…accompaniment of divorced and civilly remarried Catholics. “No one can be condemned forever” is enough for me to…ahem…question the theological soundness of Amoris Laetitia. Nearly every sentence is a nauseating distortion. You’re one of the few who have talked about the bigger picture, not just the Great Matter. Again, thank you. And I’m gonna crank up your birthday song. And cuz I’m two years ahead of you next month.